Tuple types are somewhat a foreign concept to Objective-C developers, and can sometimes be confused for either a struct or class. But in fact, they’re much more basic than both of those. I like to think of them as a miniature struct or Struct Lite™ that should be used within a minimal scope then discarded. A tuple type is a comma-separated list of zero or more types, enclosed in parentheses. They’re just a compound of other different types. Tuples may contain zero or more types, generally of a String, Integer, Bool as well as other tuples. Also please note that tuples are passed by value, not reference. This is absolute madness, the dot point syntax begins to start looking like some sort of semantic versioning for an application. The reason it looks like this is because the value type at index 1 is another tuple, so it gets its own accessors. But instead of using indexes and having to remember which corresponds to which value, it’s best practice to name your tuple’s properties wherever possible. The best place to use a tuple would be when you want a function that can return multiple types. If you’re an Objective-C developer, this concept sounds outlandish and perhaps even impossible. Previously we’ve had to overcome such problem by either return an NSArray or NSDictionary. But even that resolution can be dangerous. Because what if we try typecasting the wrong object of the NSArray and call a particular function on it? That could create a crash at runtime. For code readability, I’ve used a typealias to pre-define the tuple’s structure, and perhaps you should in your code too, it prevents you from accidentally redefining it’s structure incorrectly throughout your code. But as you can see above, there is a function call getMultipleValues() which returns a tuple of three separate and different data types, each with its own corresponding variable name. 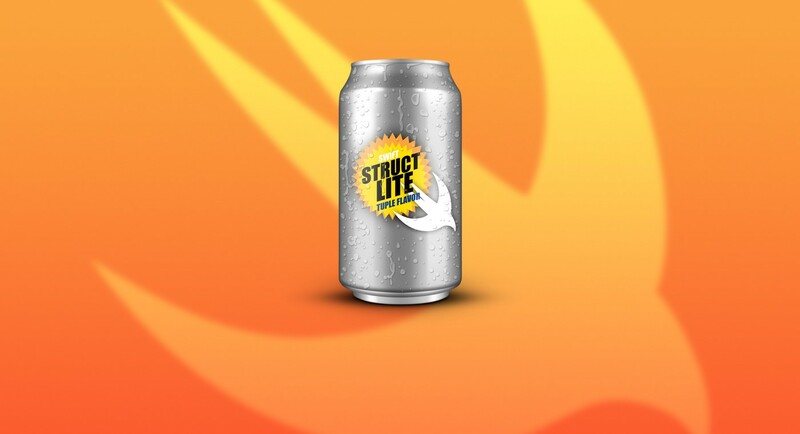 At the beginning of this post, I jokingly referred to tuples as Struct Lite™. A little known fact is that tuples can be used to instantiate structs. The CGSize struct takes two arguments, either of which can be a CGFloat, Double or Int. But hey, what if we pass a tuple into this argument? Pretty cool, huh? But there is one caveat… The tuple’s values must match exactly to the struct’s constructor arguments. Changing the order, argument labels or amount, will cause prevent the Xcode from compiling. Do you see what I did there? I changed the arrangment of the arguments by swapping the height and width locations. Even though they’re both CGFloat, the compiler cannot infer what you’re trying to do. If you’ve been using Swift previously, chances are that you’ve actually already used tuples for return types, you just don’t even know it. Below we have three separate functions, all of which do the exact same thing (nothing) and none of which return any value. doNothingA() uses the more modern standard of declaring a void function, whilst doNothingB() uses the original declaration for a void function, and doNothingC() uses the shorthand declaration for a void function by omitting it return type completely. The cool thing is, Void is just a typealias for (), which actually just an empty tuple. Because if you remember at the beginning of this post, I mentioned that tuples can contain zero or more types. There is great confusion on how people pronounce the word “tuple”. Some like to say “Two-pull”, whilst others say “Tup-pl”, and the craziest ones say “Choo-pl”. Whatever your preference is, be prepared to get called out on it. Sample code of this post can be found on GitHub. It’s just a simple Playgrounds file to help you understand a tad better. If you like what you’ve read today you can check our my other articles or want to get in touch, please send me a tweet or follow me on Twitter, it really makes my day. I also organise Playgrounds Conference in Melbourne, Australia and would to see you at the next event.